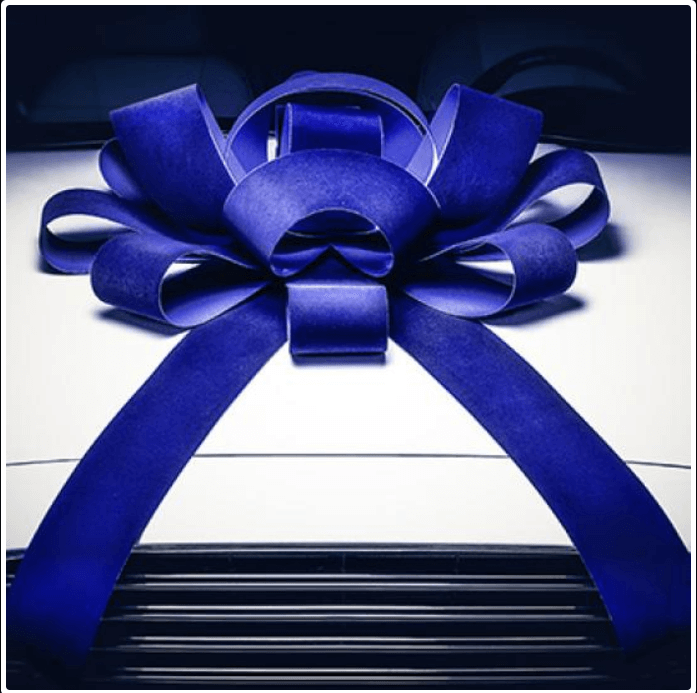 Our beautiful Large Blue Velvet Car Bow will make it a gift they’ll never forget! Add a touch of elegance with a one of a kind Blue Velvet Car Bow! Looking for large quantity order pricing (20+ bows)? Email us – orders@carbowz.com and we’ll be happy to help! Carbowz sells the Original 30″ JumBow Car Bow! We sell car bows, large bows, big bow, the original big red bow and more! CarBowz is here to support you in your search for unique and affordable promotional and event products, covering a variety of promotional needs in any venue. We offer economical options and fast free shipping. New!! Beautiful Large Blue velvet Car Bow for Every Occasion! Our Best Selling Giant JUM-BOW Car Bow now in Velvet! 30″ wide with two 30″ long x 4 1/2 wide tails. This Velvet JUM-BOW is perfect for that showroom car or any highlighted vehicle. No Assembly required. Soft Magnetic base holds the bow to either the hood or the roof of the vehicle. Ships same day. Businesses throughout the United States and across the globe know Carbowz.com is the premier source for all things bows, including big red bows, windshield bows, magnetic backed bows, suction cup bows, car bows, big gift bows, bows for big gifts, bows for open houses, bows for events, bows for buildings and bows for cars. Whether you need 1 bow or 1000, CarBowz has you covered. Our beautiful large blue car bow is the perfect finishing touch! We are the premier car bow shop! Vendors, car dealers, realtors, businesses, and event planners have consistently chosen CarBows.us to fill their marketing needs due to our well established roots, affordable pricing, fast, free shipping, and exceptional customer service. Choose from a wide variety of car bows to draw attention to events or businesses anywhere. Are you looking for a big bow to decorate for the holidays or a bow for a car you plan on giving as a gift? We are here to help! Happy customers are our top priority. Feel free to click on the chat icon, send an email or give us call if you have any questions. We are the place to go when you are searching for a giant car bow, the best bow, bows for cars, big bows for cars, a giant bow for a car, a big red bow, giant red bows, big red car bows and so much more! Visit us on Facebook to stay up to date with our latest deals!